An orange flavoured Health Aid vitamin D3 400iu liquid supplement. 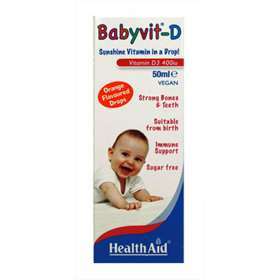 Health Aid Baby Vit D is a food supplement developed for newborns, infants and young children to help meet their daily vitamin D needs. Vitamin D is essential for enhancing the immune system and vital for maintaining muscle function. Vitamin D helps regulate the absorption of calcium and phosphorus which plays a crucial role in bone formation and mineralisation to aid the development of strong, healthy teeth and bones. Highly absorbable liquid form of vitamin D.
Free from sugar, salt, artificial colours, preservative and flavourings. RDA: EC recommended daily allowance. 10 drops (0.5ml) to be taken orally or added to water or juice. Do not exceed recommended daily intake unless advised by a pharmacist or doctor.